Come standard with three pictogram legends for direction selection. The PRMS series of commercial combination steel signs and battery units features a slim profile that eliminates light leaks combined with a simple, easy to install design. Two PAR18 small style, front mounted heads are standard, PAR36 large style or MR16 type are optional. 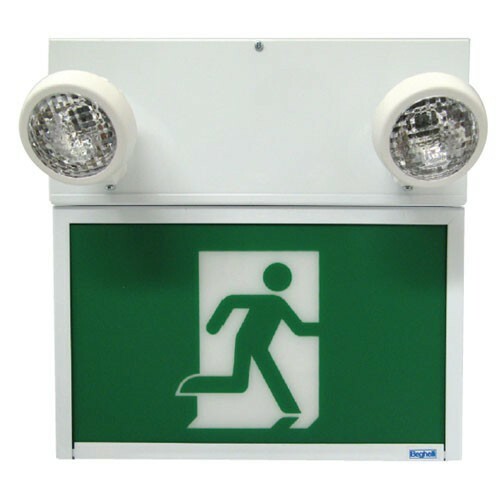 The PRMS is a series of completely self-contained, combination emergency light and running man sign, made for use on 120 or 347 volt circuits. The PRMS series are designed with high quality steel. A maintenance free, sealed lead acid battery is included with the unit that will provide 30 watts of emergency power for 30 minutes duration. A universal mounting pattern is stamped into the backplate for wall mounting directly to electrical junction boxes (not supplied). Available in white colour. As always, Stanpro is Focused on Quality. For complete warranty details, please see our terms and conditions.